Looking for all the little critters was fun for the boy and me. 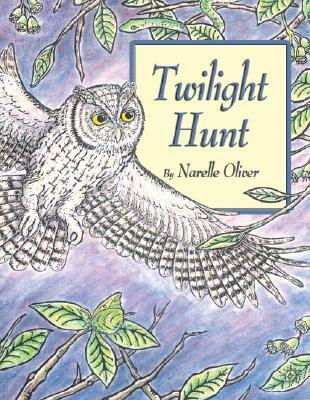 A good camouflage book with owls playing the predator role. Very engaging illustrations, especially with hidden animals to discover. Children will have fun finding the hidden animals in the lovely illustrations. The book is concerned with camoflage and the interrelation of living beings. This book is good for teaching about camouflage in the near wild. This is really well done. The story is also good for food chains since it covers various predator-prey relationships. Fantastic premise (an owl goes hunting and every time he finds prey, it blends in to its surroundings) but the artwork was drab and uninteresting. If they are going to hide multiple animals on a spread, they need to inform the reader how many to look for. Good information in the appendices. Narelle Oliver - Narelle Oliver (1960 - 2016) was an Australian artist, print maker and award-winning children's author-illustrator.Narelle Oliver was born on 25 February 1960 and grew up in Toowoomba in south east Queensland.Oliver majored in design and printmaking while studying for a Bachelor of Education degree. She began her career teaching at the Queensland School for the Deaf.Oliver was an educator and a committed environmentalist. As an illustrator, Oliver combined linocut, watercolour, pastels, collage and digitally-enhanced photographs in her work. She used many environmental themes drawing on the flora and fauna of Australia.Oliver's first book, Leaf Tail, was published in 1989.